Chicken, green onion, ginger, and soy sauce wrapped in a dumpling wrapper. Xaolongbaos, or commonly known as soup dumplings, are a classic dim sum that has recently been gaining menu adoption from coast to coast. Consisting of a thin dumpling wrapper, soup dumplings contain a savory mix with stock / fat which creates a soup-like finish. 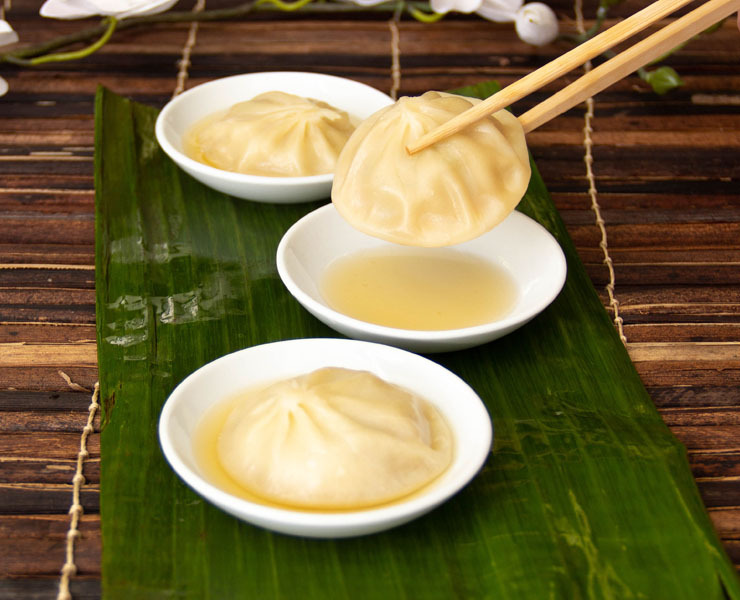 Kabobs’ Chicken Xaolongbao (Chicken Soup Dumpling), capture the flavor and presentation of these trendy dim sum, par steamed and ready to be finished in your kitchen. With a savory mix of chicken breast and thigh, fresh green onion, ginger, and soy sauce, Kabobs’ Chicken Xallongbaos are a perfect addition to enhancing your menu. Fill pot fitted with steamer basket with water and bring to a boil. Place dumplings into steamer with ample space between each piece. Do not crowd. Cover with lid, and steam for 8 -10 minutes or until dumplings are fully heated. Steamed product. Creates soup finish. Trending dim sum. Rapid adoption with patrons. Par steamed for rapid preparation in your kitchen. A blend of ground chicken, fresh scallions, and roasted garlic, accented with the citrusy-sweet exotic flavors of lemongrass, wrapped in a wonton wrapper. A traditional dim sum delicacy, perfect for frying or steaming. Stir-fried rice noodles folded with shrimp, chicken, and pan seared tofu, tossed in an eclectic aromatic medley of fresh lime juice, tamarind, Sriracha, and crushed peanuts hand rolled in a crisp spring roll wrapper. Large shrimp marinated in a hot and spicy ground chili paste with hints of red curry, sauteed leeks and coconut cream; hand-rolled into a crispy spring roll with a Chinese parsley leaf.